Born in 1902 in the provincial city of Pecs in Hungary, Marcel Breuer started to develop his designing skills at an early age. While studying at the Bauhaus in Weimar and Dessau, in... Read more the 1920’s, Breuer had the opportunity to meet some of the design most renowned personalities of that era – such as Le Corbusier, Mies van der Rohe and Walter Gropius. Proving his value as a student, Breuer actually became a protégée of the Bauhaus founder, Gropius. In 1935, Breuer moved to London to join his mentor. Nevertheless, by then Breuer was already considered one of the most renowned European designers. Breuer also practised architecture privately and worked as a professor at the Harvard School of Design. Author of incredible creations, Marcel Breuer was the first architect to have a solo exhibition at The Metropolitan Museum of Art. The Whitney Museum of American Art in New York City is, considered by many, his best-known architectural project. 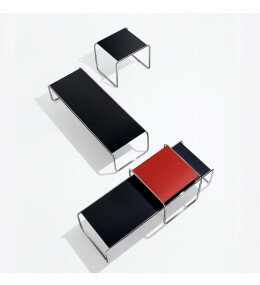 Marcel sold his furniture collection to the Italian design company Gavina Spa, which was in part the main reason that motivated Knoll to acquire Gavina in 1968. Even though Breuer never worked directly for Knoll he was clearly an influence in the company’s history and one of the early mentors to Florence Knoll. Marcel Breuer retired in 1976 and died, after a long illness, in 1981. 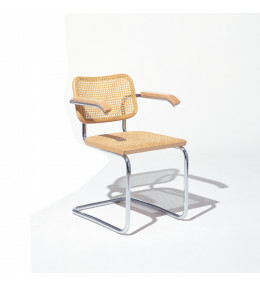 Cesca Cane Chairs, by Breuer, with handwoven cane inserts, wood frame seat and backrest. 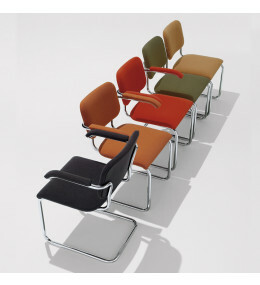 Cesca Chairs use a light gauge steel tubing with resilient form. Upholstered with Spencer textile.